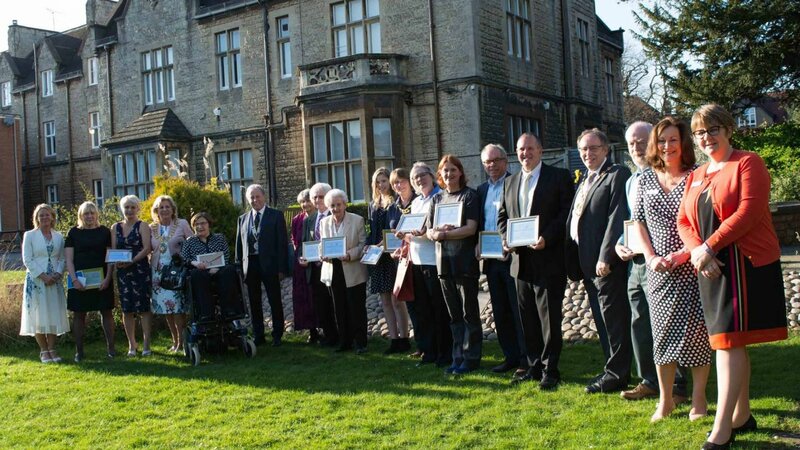 A group of dedicated volunteers were honoured for their outstanding and selfless services to the community at last week’s joint Royal Leamington Spa Rotary Club and The Kingsley School Community Awards. The uplifting ceremony, the second joint initiative between the Rotary Club and host The Kingsley School, saw the amount of awards given raised to ten. These were selected from nominations made by Rotary Club members and the school community in a quest to identify the most deserving “unsung heroes”, applying their personal time and energies in the wide range of voluntary community activities in the area. Richard Brooks, for his commitment to the Citizens Advice charity in Warwickshire. A trading standards officer by profession, Richard’s frequent contact with the charity prompted his development of interest to assist, which he has done for over thirty years. Delia Button, for her inspiring work in organising events and raising money for charities. Despite suffering from a debilitating illness since she was a teenager, Delia has raised over a £million for charities over the years. Andy Gotts, for his central role and involvement with Leamington Shopmobility. Andy’s responsibility for setting up essential procedures has resulted in utilisation nearly doubling in the past four years. Chris Johnson, for the founding and running of Leamington Night Shelter with his co-founder, Margaret Moore. The all year round facility has helped nearly 300 clients in the past year to get back on their feet again. Sue Oldham, for her work on the ‘Pathway’ project at St Mary’s Church, drawing on personal experience and helping people with drug and alcohol addiction together with those suffering mental health issues. Margaret Batten, who has been actively involved raising money for the Royal British Legion for 51 years. Margaret is instrumental in finding and managing volunteers, visiting shops, schools and business to raise funds and awareness. Steve Atherton, a Kingsley parent who for his 56th birthday, decided he would set himself 56 challenges to raise funds and awareness for the homeless in Leamington. Steve has ran the London Marathon, driven a tank, received a whole body wax and ridden the six big rides at Alton Towers despite a fear of rollercoasters. Ellie Tait, a Sixth Form student at The Kingsley School, who after initially volunteering at Scope in Leamington Spa for her Duke of Edinburgh Award, decided to continue working and has done so for the past 18 months, offering invaluable help. Cathy Edwards and Debbie Brown, for their set-up of a dementia friendly café, ‘The Little of Sunshine’, in Kenilworth; a safe place to meet other people, both patients and carers, who are dealing with dementia. Sue Mountford and Penny Sharples, who have run the Leamington Girl Guide group for many years, organising activities and raising funds for charities, in particular for those that support women and girls around the world. Chairman of Warwick District Council Cllr Allan Boad spoke of his admiration and grateful appreciation of the immense contribution volunteer organisations make to the area, and the Mayor of Leamington Cllr Caroline Evetts presented the awards. The event was rounded off by guest speaker Rachael Westgarth, CEO of Round Square, a global network of schools that promotes their six ideals of internationalism, democracy, environmentalism, adventure leadership, and service. Ms Westgarth stressed the importance and positive effect of charity and selfless service, and was particularly impressed by how many of the The Kingsley School’s pupils are actively working in voluntary roles and charitable activities.